Project Based Learning can provide a deep and meaningful learning experience for students. It allows the students to really drive their own learning, which allows that learning to stick – students will better retain the content because they are not simply passively taking in information. This year, I stumbled upon a graphic related to project-based learning that I hadn’t seen before, and it really made sense. 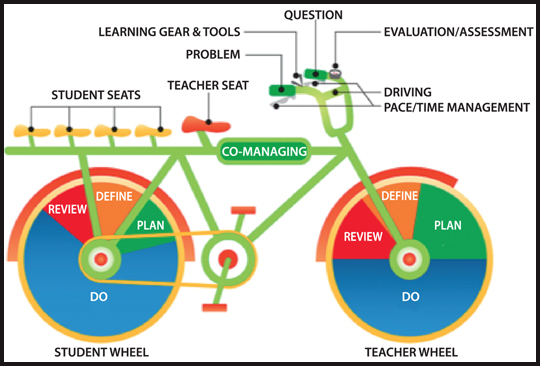 The Project Based Learning bicycle model was created by educator Charles Fadel, and I love how it depicts what is happening during a PBL lesson or unit. The handlebars include the driving question that students (and teachers) are working to answer. Also included in the part of the bike/project are the gears, representing the tools needed in the project, the bell, which is the self and teacher evaluation or assessment, and the speed, which represents the pacing of the project. Furthermore, the wheels represent a continuing process of defining, planning, reviewing, and doing, both by the teacher (analyzing the construction of the project and whether it meaningfully meets objectives) as well as by the student (analyzing their work in answering the driving question). If I had created this PBL resource, I would have placed the teacher as “bike salesperson and mechanic” instead of as the front rider of the bike. The teacher’s job is to design and facilitate as students drive their learning. There are many resources available whether you’re just beginning to use PBL or if you are already an expert… but sometimes it can be hard to put your finger on the right resource when you need it. So I have pulled together some of my favorite PBL resources and I’ve grouped by their content to make it easier to find what you need. New to Project Based Learning? Take a Course from EducationCloset – Project Based Learning in the Arts Bundle or Project Based Learning in the Arts Course. Need a preview? Check out this free webinar. Read a great overview of Project Based Learning from Cult of Pedagogy. Is it a Project, or PBL? Find out here. What are the 6 Must Haves of High-Quality PBL? Find out here. Dimensions of Learning and Understanding by Design: These are not very current, but the structure and foundation that Dimensions of Learning and Understanding By Design provided has helped me to organize my instruction to make Project Based Learning work for me. Find out how to Structure the Chaos that PBL can bring. Learn how to overcome challenges when implementing PBL in an arts classroom. How to use a Project Log for formative assessment during PBL. How to Build the Essential Component of Reflection into PBL. Find resources for writing driving questions and essential questions. Why We need Real Problems. Are We Overplanning Student Experiences? Yes, PBL Gets Students Ready for the Test. Are you struggling for ideas to implement PBL in the arts classroom? Find inspiration here. A PBL classroom can look chaotic for someone who is not familiar with the approach. Here are some suggestions on how to help visitors quickly understand how to see the learning that is occurring. This list is certainly not comprehensive. After all, it is a working collection of links that have helped me on my own Project Based Learning journey. Do you have other suggestions? Please help me add to my list by including a resource in the comments below!